David Wheatley, Green Guild Project Manager at the Liverpool Guild of Students. Tidy Planet’s A700 Food Waste Rocket Composter – a 240-volt automatically controlled and intermittently aerated vessel. The equipment is designed to recycle organic wastes from catering or food-service facilities, on-site. 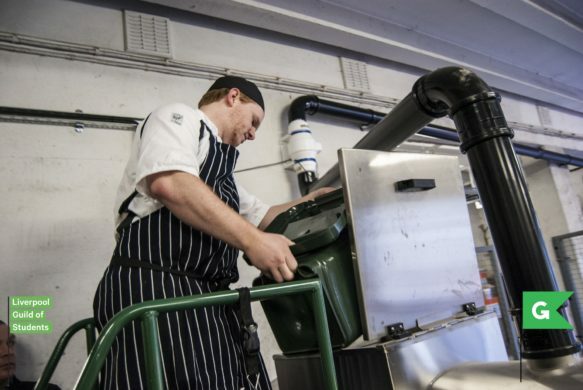 This specific model is able to process up to 700 litres of food waste per week, but we also invested in a Dehydra Food Waste Dewaterer to further maximise this capacity, taking this up to 2,100 litres. The dewatering element of the process optimises the moisture content of the food waste, so that the feedstock which enters the Composter will output a nutrient-rich, high-quality compost resource. The Guild is passionate about promoting sustainability to university students and boosting recycling rates, so we wanted to implement an initiative that would have a lasting impact. And given that food waste accounts for 10% of The Guild’s overall waste figures, it was important that we found a way to optimise it as a useful resource. At the students’ union, we also have roof gardens and cultivation plots – used to grow vegetables by student volunteers. So, having an on-site composting facility enables us to close the loop in our food-waste management model – as well as working as an educational waste-awareness tool. We wanted a solution that would demonstrate an effective circular economy – seeing the food that is grown, prepared, served and eaten at The Guild successfully recovered to grow more organic produce for the campus canteen. In the Environmental Association for Universities and Colleges’ weekly newsletter, I saw that Salford University had invested in composting technology to harness their food waste as a resource. So, I then contacted the University directly to organise a visit – with staff from The Guild and our catering team – to see the machine in action. We also used a really useful flowchart tool to help us decide – answering questions about our waste requirements and preferences, to help us determine which kind of technology would best suit our needs. How many options did you consider and what were they? We did lots of research – including around on-site AD options – but we couldn’t do this due to potential odour issues. And after seeing the Tidy Planet Rocket Composters in action in Salford, we were steered towards this option straight away. Composters are commonly associated with agriculture, but the fact that we can compost in the middle of a metropolitan city is incredible – a prime example of urban farming. The equipment needed to provide an easy-to-use, low-maintenance and cost-effective solution for The Guild’s food waste. 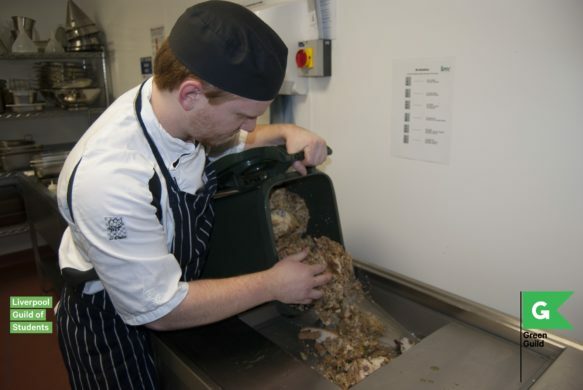 Its aim was to reduce our food waste recycling rate, and since installing the technology, around 9 tonnes of food waste have been composted to date. In addition, by removing food waste from the equation, we’ve also been able to reduce the number of general waste bins on campus – replacing them with dry mixed recycling alternatives. This has not only positively impacted our carbon footprint with fewer collections, but our disposal costs have also been greatly reduced. Working in the education sector, the main challenge was finding a solution that would pose no health and safety risks to staff and students – as well as require minimum maintenance and servicing. How does the equipment fit in with the university’s future plans? The successful installation of the equipment means that we can continue to be recognised as driving sustainability forwards in the education sector. The composting technology has attracted other universities, international industrial organisations and local schools – as well as the NHS – on their own fact-finding visits! As a result of our environmentally-conscious efforts, our overall waste recycling rates have doubled since investing in the Composter, and we’ve also received a stream of awards – having most recently been shortlisted as a finalist in the ‘Food and Healthy Eating’ category of The Green Gown Awards. Is the equipment future proofed? Yes – we feel that we’re ahead of the game in being able to demonstrate food waste sustainability and resource security on campus. There’s no hiding away from the fact that food waste legislation is tightening, and with the Government’s recent plastic tax regulation proposal, it’s only a matter of time before the same applies to organics too.